Jobu discusses the possible role that another Yankees prospect, Dellin Betances, might be able to play in 2014. The other day, we kicked off a new post series for Jobu’s Rum called Youthful Injection, in which we detail the careers of some Yankees minor leaguers and predict what kind of role they might have with the 2014 version of the team. Today, we’re going to take a look at a guy who was once atop the organization with Banuelos, as far as future potential, before falling from grace and reemerging as a possible bullpen weapon. 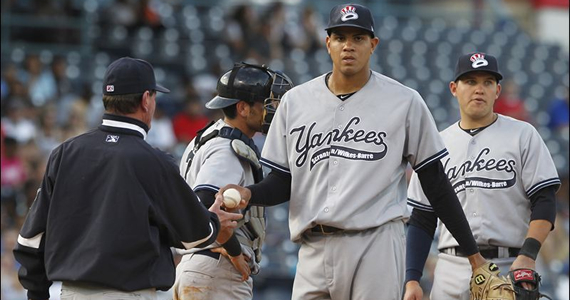 Let’s talk about Dellin Betances, shall we? Most Yankees fans will remember that we have all seen Betances before; he had cups of coffee with the team in both 2011 and 2013. We’re going to start this post back in 2006, when the Yankees drafted the then 17 year Washington Heights native in the 8th round of the amateur draft. Betances had first round talent, but his $1MM bonus demand turned away many teams (Betances had accepted a scholarship to Vanderbilt University as well). When he fell to the Yankees in the 8th round, they drafted him and paid him his money. Betances started his slow climb through the minors with the Gulf Coast Yankees of the Rookie League at the age of 18. 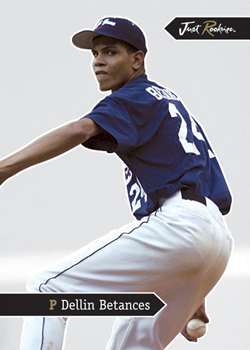 Baby Betances back in 2006. It is clear that Dellin has the tools to be dominant, so why hasn’t he been? As often happens with bigger guys, sometimes it takes them a long time to figure out their bodies and mechanics. Not everyone can be dominant from the get go, like CC Sabathia was as a 20 year old. More often than not, you see guys take the path Randy Johnson took, struggling with their mechanics, command and consistency, and are sometimes in their late 20s before they put it all together. As they say in the real estate business… It’s all about location. Location! Location! When he’s been at his best, Betances has been unhittable. In 2010, over 17 starts, he put up a 2.11 ERA with 108 Ks and only 22 BBs in 84 innings (2.35 per 9 innings). Since then, he’s walked 211 men in 341.2 innings (5.5 per 9 innings). During this time, he also hit 29 men and thrown 35 wild pitches. During his brief stints in the majors in 2011, he showed the same exact patterns, walking 6 and hitting 1 in just 2.2 innings. It seemed the Yankees were about ready to give up on him. They took him out of the Scranton rotation last year and stuck him in the bullpen, hoping that the shortened outings would boost his performance, and reduce the chances of his mechanics becoming unraveled. So far, it seems like a great gamble. Betances rebounded very nicely as a late inning reliever in 2013, putting up a 1.35 ERA in 60 innings after the switch (he had allowed 16 runs in 24 innings as a starter). Betances walked 26 men and struck out 83 out of the pen. The walks are still a little high, but better than they were as a starter for sure. The Yankees called him up in August and had one bad outing in which he allowed 4 runs in 0.2 innings against the Angels before being sent back down. When he was brought back in September, he fared much better for himself, allowing no runs in 4.1 innings, while striking out 8 and only walking one. He has, effectively, put himself back on the prospect map; at least as far as being a helpful member of a major league roster. The Yankees lost Joba Chamberlain, Boone Logan and Mariano Rivera this off-season. They have signed Matt Thornton, but the bullpen still needs a lot of help. 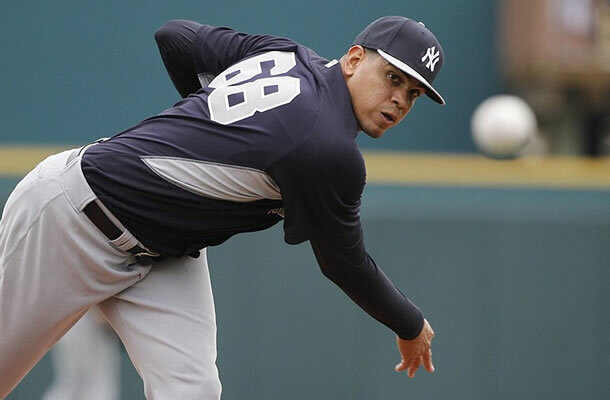 Betances could earn himself a bullpen role with a good Spring Training. If he can replicate his numbers from AAA and his September call up in 2014, that would help the Yankees out a whole lot. Realistically, I think Betances will probably find himself back at AAA to start the season, but will definitely be one of the first guys called up when the Yankees need reinforcements. At one point or another, he’ll get his shot to secure a big league role. Here’s hoping he can do that. I put the over/under on him reaching the majors at May 7. What do you guys think?